This particular project was for the text of Macbeth, but you can adapt it to ANY text. What if the Cast of Macbeth had an Instagram? Instagram is a great form of photo sharing and social media. 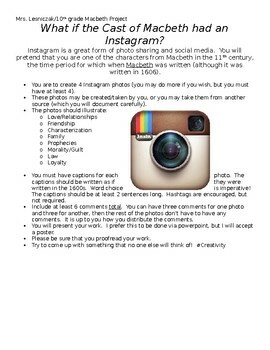 You will pretend that you are one of the characters from Macbeth in the 11th century, the time period for which when Macbeth was written (although it was written in 1606) and create and Instagram page for this character!